I have attempted to draw attention to the wonders of hand crafted wristwatches, the most exclusive, valuable and prestigious being those made by the likes of Roger Dubuis, Patek Philippe, Parmigiani, Girard-Perregaux, Chopard, Blancpain, Audemars Piguet, Breguet, Vacheron Constantin, and IWC, all of which draw on a long tradition of precision engineering, ingenuity and intricacy. In 1999, Richard Mille seemed to herald a new chapter to this horological history, using new techniques and materials to threaten the established “big boys”. But these “big boys” were already under threat — from FP Journe! 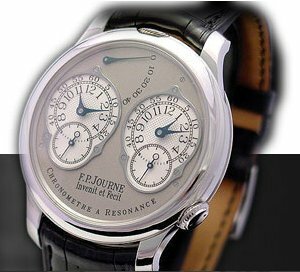 François-Paul Journe is the man behind the “Chronometre à Resonance” and the “Tourbillon a Remontoir d’Egalité” (launched in 2000), and is one of the most talented and exciting watch maker of his generation. A true maverick. His Geneva factory is just two workshops and an office. Each watch is entirely assembled adjusted, cased up and tested by one of his 20 watchmakers. The parts are manufactured and finished to Journe’s specifications, by about 40 different suppliers. The dials are a third of the surface of the face yet they show the hours, seconds and minutes very clearly, even with only half the dial showing from beneath the shirt cuff or jacket sleeve. Twin independent movements indicate times on two dials. This is the first wrist watch working with resonance — the first timekeeper designed specifically for precision the wrist. 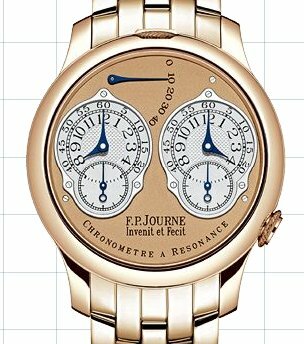 The “Big Boys” think Journe should have been a supplier, not a brand, but FPJ does things his own way. With a potential annual production of about 600 pieces, he is taking the cartel head-on. FPJ is meeting (and some say surpassing) their exacting standards. His work matches their claims of innovation and creativity, he undermines their myths, and upstages their complications — and most importantly, his wristwatches are a fraction of the cost of theirs! At this price, he is in the low end of the market — along with Hautlence, Rolex, Omega, Cartier, Breitling, Tag Heuer, Gucci, etc., although his production is too low to be in competition with them. His rivals would be the smaller independents, or the likes of Jaquet Droz (part of a larger group). He shocked the watch making world by apprearing to snub the COSC — the global authority that awards the title “Chronometer” certification. FPJ is on record as sneeringly claiming that the COSC test is not much of a challenge because (a) the standards are too low, (b) it is non-competitive, and (c) because the static tests were originally devised for pocket-watches, they are meaningless for modern wristwatches — and especially for his resonance watch. 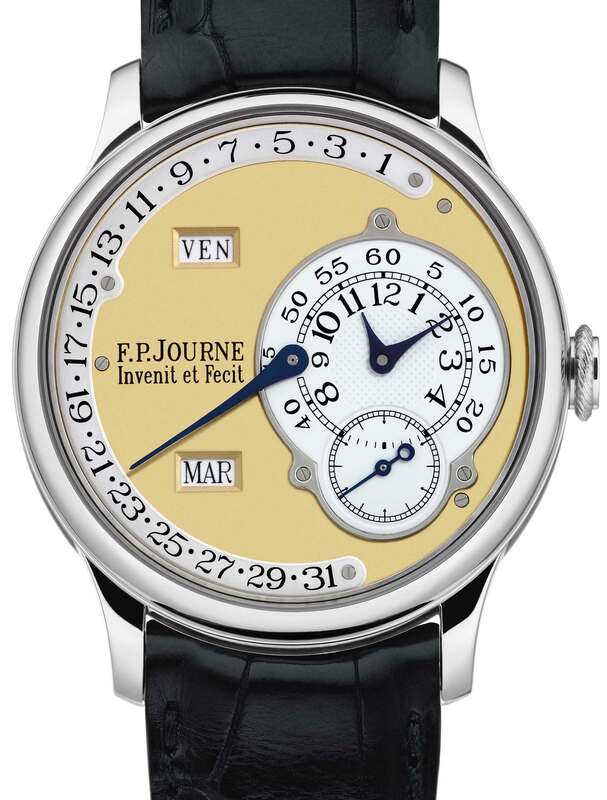 So FPJourne insists on calling his wrist watches “Chronometers” without them being tested and certified — and this leaves him venerable to litigation. Then there was the scandal, in 2002, of Swiss Fine Timing (of Illinois, USA) who stopped dealing in Journe watches because more than 100 watches had to be repaired under warranty due to a metallurgical fault in the ratchet wheel and/or the dates-wheel breaking. This harmed the brand for a couple of years, but FPJ is too much of a perfectionist to be down for long. This entry was posted on Saturday, September 22nd, 2007 at 01:14 and is filed under Articles of Interest, Design Specials, Wristwatches. You can follow any responses to this entry through the RSS 2.0 feed. You can skip to the end and leave a response. Pinging is currently not allowed.